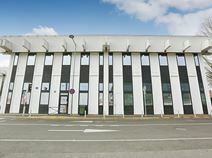 This business centre is located about 30 minutes outside of central Paris' CBD on a business park that is popular with companies that work in logistics and distribution. There is an on-site hotel ideal for visitors and world-class transport links. There are voicemail services so you’ll never miss a thing as well as convenient parking for you and your clients. The centre is accessible 24 hours a day from the 106 road link. Smart serviced offices perfect for smaller companies are available over one floor of this light and airy building with lounge areas and a luxurious reception area. The centre is within a business park which offers a staggering array of facilities including a crèche, restaurants, dry cleaning services, a gym, travel agent and bakery and many others. Very close to Paris-Orly airport, this is a self sufficient area but has good motorway links to surrounding towns and Paris itself.